Both volumes of the New York Times bestselling The Graveyard Book Graphic Novel are now available in a single-volume paperback edition! Each chapter in this adaptation by P. Craig Russell—now combined into one splendid volume—is illustrated by a different luminary from the comic book world, showcasing a variety of styles from a breadth of talent. 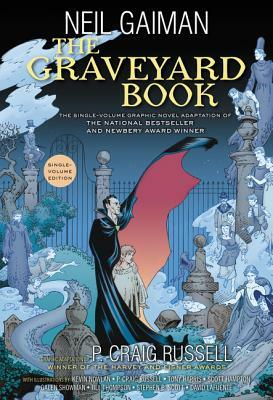 Together, they bring Neil Gaiman’s Newbery Medal-winning, nationally bestselling novel The Graveyard Book to new life in this gorgeously illustrated graphic novel adaptation. Inventive, chilling, and filled with wonder, Neil Gaiman’s The Graveyard Book reaches new heights in this stunning single-volume paperback edition.